The opening ceremony of 10th KPMC has been held in Seoul Korea on 23th of Nov. after opening ceremony, two matches are supposed to be played on 23th~25th and closing ceremony on 25th. 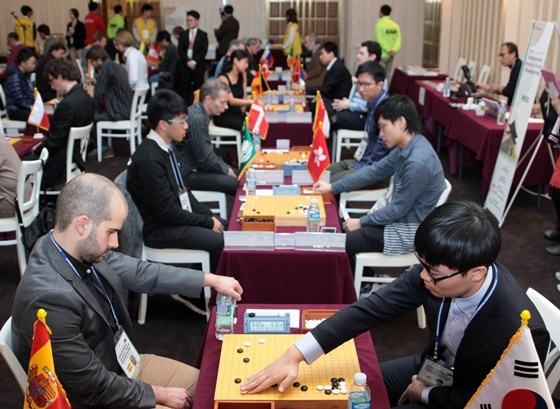 Total 52 counries representatives have attended this Baduk festival in Korea this year. 15 counries from Asia, 28 countires from Europe, 1 country from Africa, 8 countries from North and South America and 2 counries from Oceania. From Korea, Kim HeeSu born in 1997 is ready. He has got a ticket after getting through severe selection tournamnet which was held last May in Korea. Kim HeeSu got 2 wins in the first day, against Alon Gonjales from Spain and Christian Pope from Romania. The rival of Korea, Hu YuChing from China is ready and got 2 wins as well in the first day. Eric Lui from US and Lai Junfu from Taiwan also got 2 wins with Korea and China representatives. But Osawa Shinichilo from Japan lost one game in the first day and seems to be far from winning this year. This tournament is operated by 6 rounds of swiss league and 40 minutes and 30 seconds 3 times are given to all. In the past, Korea won 7 times while China and Taiwan 1 time each.